"Recent progress in digital and information technology has hugely increased our ability to record and analyze data, and the sweeping new creative vistas thus opened up in the field of software applications has been accompanied by a dramatic increase in expectations with regard to the presentation and usability of teaching material. In view of these developments, the Ministry of the Aegean decided to produce a CD ROM recording every archaeological site in the Aegean from Prehistory to Late Antiquity. 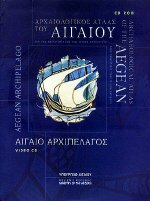 The CD ROM is a creative digital version of the "Archaeological Atlas of the Aegean" (published in book form in 1998) which includes additional illustrative material and short film clips. Providing an original compendium of the archaeological sites on the islands and the coasts, the Archaeological Atlas of the Aegean also provides a detailed index of every site uncovered to date. The Atlas is accompanied by a short film "Aegean Archipelago", a poetic reconstruction of the history of the Aegean from its creation until today. We hope that the electronic atlas will prove a useful tool for researchers, teachers, and travelers alike. We also hope that it will help raise awareness of the timelessness and wealth of history of the Aegean, thereby assisting us, in the best possible way, in our unceasing efforts to protect and disseminate the culture of the Archipelago." Of interest to Vangelis collectors is the short film "Aegean Archipelago", which is the film presented on the VCD. This 1998 short was first premiered in Lisbon at the international exhibition, EXPO 1998, on the occasion of the global celebration of Oceans and Seas. It was directed by Angelos Hadjiandreou, with Cinematography by Nikos Smaragdis. The music is all by Vangelis, with the exception of the opening sequence, which I am told is "The Host of Seraphim" by Dead Can Dance. It contains previously-released material set to images of the Aegean and the surrounding coastline. When watching this short, I immediately understood the connection between the sea and Greece, and imagine what Vangelis felt when viewing the majestic sea and composing the tracks on Oceanic. The music used includes "Mask Movement 1", "Bon Voyage", "Rachel's Song", "Prelude", "La Danse du Feu" and a reprise of "Prelude" to finish the short.